Located in Northern VA, Mighty Clean specializes in Residential and Commercial Carpet Cleaning, Upholstery Cleaning, Tile and Grout Cleaning, Rug Cleaning, Pet Stain and Odor Removal, and Commercial Carpet Cleaning. Our service area includes Fairfax VA, Centreville, Ashburn, Gainesville, Bristow, Haymarket, Alexandria, Arlington, Reston, Clifton, Chantilly, Herndon, South Riding, Springfield, and all surrounding areas. Not All Carpet Cleaning is Created Equal! That’s right, not all methods and certainly not all carpet cleaners get your carpets truly clean! In fact some carpet cleaning does little more than brush the dirt off! Did you know a bad job can leave the carpet soaking wet and in worse shape than before it was cleaned? So what does Mighty Clean do different? Our exclusive process cleans deeper and more thoroughly to remove the most soil, bacteria, and allergens. Hundreds of cleaning passes, not just 2 or 3, are quickly accomplished with our rotary powered wand to thoroughly flush the dirt and allergens from your carpet. You wouldn’t clean your clothes without agitation would you? Just as your washing machine spins to thoroughly clean and rinse your clothes, so does our rotary powered carpet cleaning wand. We Use A Rotary Extraction Wand! 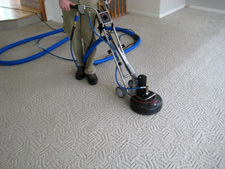 It’s easy to see how our Rotary Wand cleans more thoroughly by gently brushing the carpet pile as it flushes out soil and other contaminants. That’s why we use it on every job not just the ones that “appear” dirty. Julie P. of Fairfax Virginia told us that during the 10 years she has lived in Fairfax she has had her carpets cleaned several times. Normally the carpet looked clean at first it would re soil very quickly. After having her carpets cleaned by Mighty Clean she said the carpets were dry sooner and stayed cleaner longer. Most carpet isn’t cleaned as often as it should be, so whether it appears dirty or not make sure you get the most thorough cleaning available.